When you get a good set of throwing knives you want them to last as long as possible while you are practicing throwing them at a target. To ensure you do not cause unnecessary damage to your knives it is best to use a target board that was specifically made for throwing knives. Because the material for these are made such that the knives can stick into it and not fall out too easily as well as the material also protects the tips of the knives from bending. When you throw a knife into a tougher target over time this may cause the knife tip to bend especially if the tip does not strike the target at a perfect angle. Also, continuous sticking into a tough target makes the knife tip dull quicker and then you have to constantly sharpen the tips for them to stick better. If you know enough about throwing knives you will know that too much sharpening over time can throw off the balance. Here are some knife throwing target boards that we recommend (and do not recommend!) of various design styles and colors. 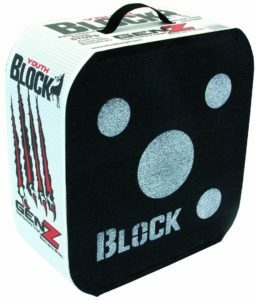 Designed for 40lb bows, this youth archery target block is perfect for use for knife throwing instead since the impact of a thrown knife nicely lines up with the low impact of a youth bow. 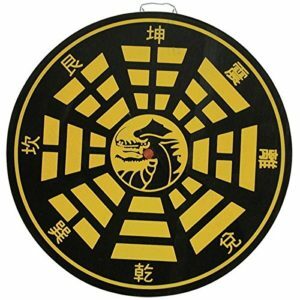 This or a similar type of archery target is far and away my choice for target practice. 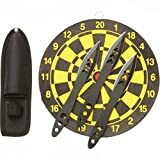 There are other targets specifically marketed for knife throwing but I have yet to find one that did not have quality issues that made them not worth purchasing. PORTABLE - With a built-in handle, the BLOCK Gen Z is easy to transport. It is also light weight making it easy to carry, even for the young archer! 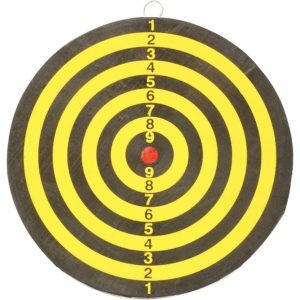 These are just paper targets you would put over an appropriate backing and not a substitute for throwing your knives at an improper surface. 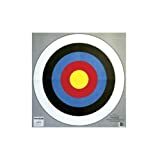 That said, these targets can usually be gotten for pretty cheap and I like using them for some impromptu target practice or if I am throwing my knives against something that does not have something appropriate for me to aim at. This is made of 1-inch thick compressed material specifically designed for knife impacts. There is a metal hanging piece included at the back for wall mounting. Quality issues on this can be really hit or miss so only buy this if you can get it for pretty cheap or you have really light-weight knives. This target actually comes with 3 throwing knives included. The price is pretty decent and this would make an ok starter gift, but do not expect the target or the knives to last very long. The Cold Steel Thrower has a 9-inch blade and a handle that is 4 and ½ inches long with a composite plastic finish. A small throwing knife is about 4 inches long while a large throwing knife is about 13 inches long. This puts the Cold Steel just about medium length which is good for practicing purposes. Looking for the Best Throwing Knives? Throwing knives are becoming increasingly popular mainly due to what I believe to be the rise of them in video games. However, when looking for the right throwing knife whether you are a beginner or expert you want to 1) make sure it is a quality knife and not some cheap knock off and that 2) you practice with it and in a safe environment where you are not going to hurt anyone. Throwing knives is a very exciting hobby to have. If you are the dare-devil type and seek thrill every day, throwing knives will just be perfect for you. This is a very dangerous kind of hobby and it takes a long time of practice before you are able to see yourself a master of this craft. When you achieve mastery of this hobby, people will be totally amazed to watch because there are only a little group of people on this earth who are brave enough to throw knives for entertainment. If you are really interested in throwing knives, your first step will be looking for cheap throwing knives for sale. You need to acquire the right kind of throwing knives so you can start practicing. Fortunately, there is good quality online stores which offer throwing knives for sale both for professional knife throwers and the novice like you. Invest some time in looking for stores which offer great deals and prices on their knives. When you have a good quality throwing knife to practice, you’ll be having a good start on your way to becoming to be a professional knife thrower. Throwing knives for sale can be purchased in single or in sets. For someone who is just starting, a couple of throwing knives will be enough and save your money for purchasing more quality knives later. If you have enough money, you can also try purchasing at least five cheap throwing knives for sale to give you an allowance for your practice. Because you are a beginner, you are more likely to break your knives in practice so it will help if you have spares to use. Before you purchase throwing knives, it will help if you know that there are many kinds of throwing knives to choose from and each of these has their own styles of throwing. You must choose one at a time and master the art of throwing it before you proceed to the next one. Throwing knives have different shapes and sizes and throwing knives is all about the calisthenics. Don’t risk yourself any injury and take the time to focus on one kind of throwing knife before checking out another. Throwing knives are categorized into several kinds. There are double sided knives, an eagle eye knife, a hollow handle knife, a jack ripper, or a spear silver wing. There is at least a dozen more throwing knives for sale in the market. As soon as you practice your skill and you are ready to try more, you can easily find more exciting throwing knives for sale online.